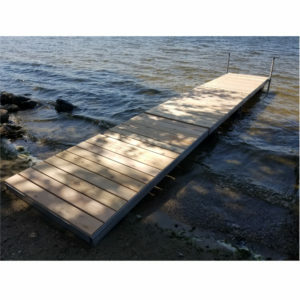 Patriot Docks modular dock frames utilize custom aluminum profiles and professional engineering, to create a very strong yet lightweight dock design that is simple and easy to assemble. The 4’x8′ frames bolt together which allows for exceptional versatility and customization. 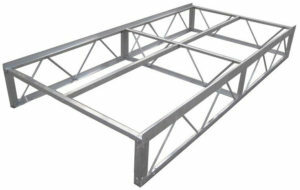 Full 12″ high truss work allows for more land on the support pipe creating very rigid structure. Patriot docks can be configured into rolling, stationary or floating docks. Additional sections can be added to create any style or configuration, including “T” and “U” shapes as well as fingers and slips. We also offer a wide array of accessories to finish off the project, such as benches, ladders, ramps and bumpers. No matter what your lake application, we have the products to get you on the water. Stationary docks are great for permanent applications where the dock does not require removal and water depths stay fairly consistent. Stationary docks are often installed on lakeshores with heavy vegetation or bogs. Once out to the ideal water depth, it is common for a floating or rolling dock section to be added to the stationary pier. 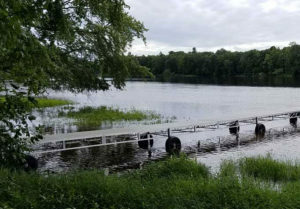 This allows for the dock section that is exposed to the lake to be removed for the off season, while the sheltered pier is left in place as long as there is no threat of ice damage. 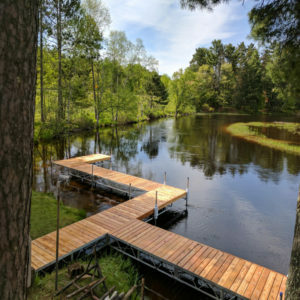 Floating docks are excellent in deep or fluctuating water levels and extremely soft lake bottoms. Rectangular foam filled floats are used to support the floating pier. It is recommended that at least three rectangular floats are used for every 16 ft of dock frame. Floating docks require little maintenance, as there are no post heights to adjust.. Floating docks can be pulled up on shore, turned parallel with the shoreline, or on smaller bodies of water they can be left right in place. Floating docks are typically anchored in place using post and sleeve pilings driven down into the lake bottom. In especially deep water situations, multiple anchors can be used to hold the dock in position. 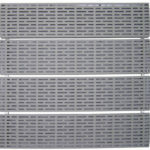 Patriot Docks offers three premium grade decking options to suit any environment. 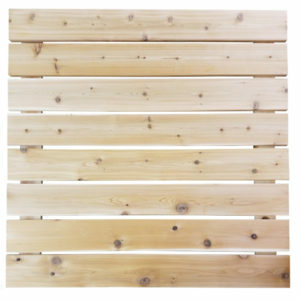 Kiln-dried Western Red Cedar, maintenance-free Polypropylene Composite, and long lasting Powder Coated Aluminum. 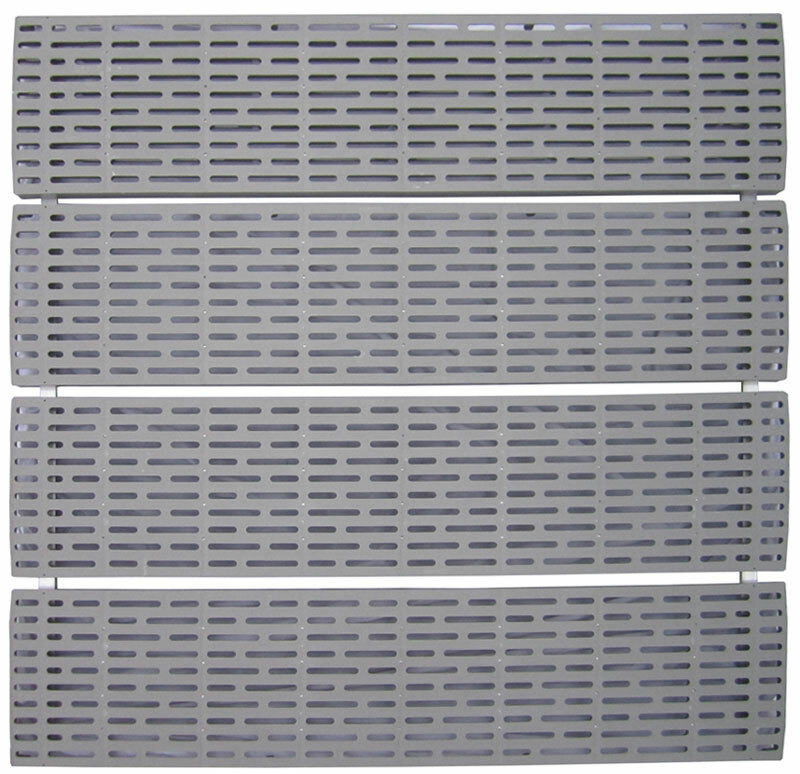 All of which are made into 4’x4′ drop in panels for easy installation and removal. Click here to see more details about our decking options.